Zabaglione (zah-bah-YOH-nay), which literally means “egg punch” in Italian, is a creamy dessert made of whipped egg yolks, sugar, and Marsala wine. It’s another dessert-of-a-million-names-and-spellings, including: zabaione, zablaiogne, zabajone, and sabayon. This is a super-classy, restaurant-style dessert that you can make at home without a pastry chef degree. A cup of pure zabaglione cream is too rich for my kids, so we added a dense, moist, and not-too-sweet chocolate sheet cake to the mix. 1. To make the zabaglione cream: In a medium saucepan, whisk the eggs until they are pale yellow. Gradually whisk in the sugar and whisk until thickened. Whisk in the flour, and then the Marsala. Whisk constantly over medium-low heat until the mixture is thick and is just beginning to bubble, about 5 minutes. Immediately transfer to a medium bowl. Press a piece of plastic wrap directly on the surface of the egg mixture and poke a few holes in the top with a knife. Refrigerate until chilled, at least 2 hours. 3. Sift the flour, sugar, cocoa, baking powder, and salt together into a medium mixing bowl. Add the milk, melted butter, eggs, and vanilla. Mix with an electric mixer on medium speed for 2 minutes (set a timer), occasionally scraping down the sides of the bowl with a rubber spatula. Spread the batter in the baking sheet. 4. Bake until the cake springs back when pressed in the center and it is starting to pull away from the sides, about 20 minutes. Transfer the cake in its pan to a wire cooling rack and let cool completely in the pan. 5. To finish the zabaglione cream: In a chilled medium bowl, whip the heavy cream with an electric mixer on high speed until soft peaks form. Stir about 1/4 of the whipped cream into the bowl of the cooled egg mixture to lighten it. Fold in the remaining whipped cream. Refrigerate until ready to serve. 6. To assemble the cakelets: Using a 3-inch diameter drinking glass with straight sides, or a cookie cutter, cut out 8 rounds from the sheet cake. (Nibble on the scraps, or give them as treats to the kids.) 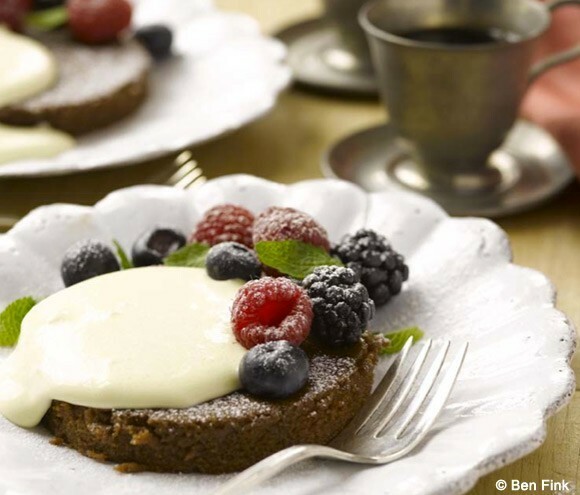 For each serving, set a chocolate round on a dessert plate, and spoon about 1/3 cup of the zabaglione cream over it. Scatter the fruit around it. Sift the confectioners’ sugar through a wire sieve over each cakelet and serve immediately. Didn’t know about the cream.I’m italian and my flmaiy always made Tiramisu using the egg whites too:* Egg yolks whisked with sugar (like you did)*Combine Mascarpone with the yolks. * Egg whites whisked with a tiny bit of salt until they get stiff. *Combine the whites with the yolks+mascarpone.